Sorry for the lack of posts for the last couple of weeks but I’ve been away on holiday to Italy with my family. This year has taken a lot more planning than the usual “chuck everything in the suitcase and leave” strategy. This year we have been planning our holiday for months to ensure it all went well whilst travelling with my 9 month old baby. We had a great time with my family, eating lots, drinking lots and sleeping lots. It might sound like a chill out holiday but with a little girl who can move faster than lightening and us staying in the family home, which got stuck in the 1950’s (seriously, you have to plug the shower into the mains in the bathroom and plugs have no earth wires!) it was spent trying to keep her safe and entertained whilst allowing her freedom to enjoy her holiday. Plus the heat and humidity meant that everyone wore so much suncream they were slippier than a fish. But heat and scary house aside we enjoyed it… a lot. 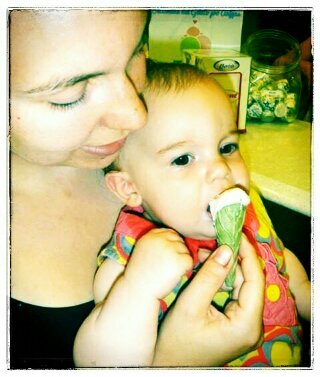 I decided that Italy should be the place for my little girl, Alice, to have her first ice cream. Where else does the best flavours like this? It beats down a cornetto any day. I’d love to have a go at making ice cream like this at home but our freezer always stores meat and pasta sauce and I really don’t have room for another gadget I won’t use very often. So till next year I’ll just dream of ice cream and Italy.